I’m in pretty good shape compared to the many Ford Rangers I’ve beat up over the years. Hauling big stone takes it’s toll. Not everybody finds dealing with boulders back breaking. My buddy Stewy couldn’t wait for me to finish the birdbath. After laying so much stone I’m laid out. At least I managed to bring some home. I never considered it work. Building with stone is a back breaking good time. Sometimes I think about a place to sit. A ripple in time is etched upon stone. Or should I say, time etched ripples in this stone? Unfinished business never bothered me. I enjoy sitting and wondering what I’ll do next. This was pretty close to being a block retaining wall. While talking ‘Garden’ I happened to groan when the home owners mentioned they were going to have someone use prefab block to build a retaining wall. It just slipped out and instead of passing it off on my aching back (at the time I was hobbling) I had to go open my mouth and let the truth dribble out. The pain was all in my head. I could see it in my mind, a simple functional piece of commercial drab so uninspiring that it made me sad. I’ve suffered from visions as long as I can remember so it was no surprise I had another right then. I could see it but I couldn’t fully explain or describe it. But I had to stop the blockheads. I told Mr and Mrs. Homeowner that natural stone would look ‘oh so much nicer’ and that it was available and wouldn’t cost much more than the block. I had no idea how much the blockheads would charge to install the wall so couldn’t compare labor costs. But it would be significantly higher if I did it. Since they were both St. Lawrence University people and members of my wife’s (small) church I assured them it would only be slightly higher. I didn’t tell them I have an obsessive compulsive habit of doing stuff only an idiot would try. This is a reflection of my vision. I wish the sun hadn’t been so bright. A few boulders (including the one from the last post) were transplanted during construction. Upended from the edge of a rural hayfield they’ll have to adapt to village living. I’m pretty sure they’ll settle in fine. I couldn’t see a block wall extending down the length of the driveway demanding you walk around it. Call me lazy but there’s no way I’d walk the long way around to get to the backyard. I’d rather spend a week busting my back so I wouldn’t have to. Besides, this is a bit better looking than cement block wall, wouldn’t ya say? If you want to get some of this sandstone for yourself the location is on RT 37 between Hammond and Redwood at the rest area by the county line . You’ll see the sign and the old stone house, ya can’t miss it. You need to phone and make an appointment before going. Call: 315-771-2128 and ask for Tim. Just keep your hands off the stone I want. I wasn’t looking for work. I was just talking ‘garden’ with someone my wife knows when the subject of the driveway and a retaining wall came up. The home owners were planning on having a block retaining wall built before paving the driveway. I cringed at the mention of block and then had to go open my mouth about how much nicer real stone would be. Last year some drainage work was done along the side of the garage. It was plain to see the retaining wall the excavator built was only temporary. It did hold the soil back but you can see it had a bad leak at the bottom. Make a note – retaining walls need to extend below the grade. The morning was spent digging out along the garage and removing the landscape timbers. I got lucky and found a deep base of sand so there was no need to haul in stone dust for the base. Instead it was off to the quarry to get the first loads of stone. Unfortunately the first day had to be called short on account of a wicked thunderstorm. No way was I going to wave my steel bar around with lightning strikes nearby. At least we got the heavy stuff off my helpers truck before having to flee. My truck remained loaded over night. 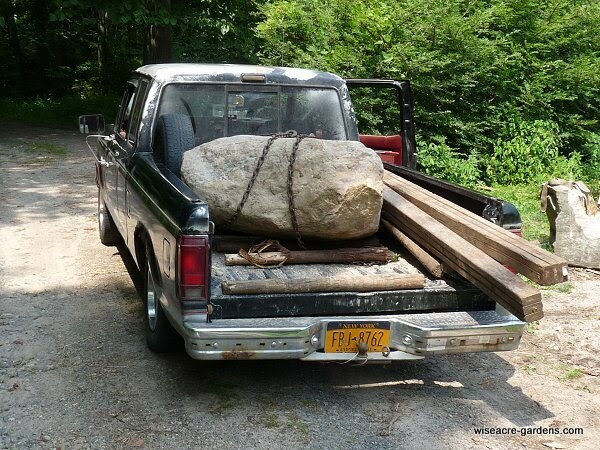 That’s nearly a ton of stone on a 1/2 ton pick up. Say what you will about Ford but their little Rangers can handle a load. Once my truck was unloaded we headed out for two more loads. By the end of the day the job was showing some progress. My old truck, now belonging to my helper was taking some abuse and I could feel the hesitation on his part to continue hauling rock. I couldn’t blame him, I may be an idiot but he isn’t. I worked alone, got a load and barely managed to get the next slabs unloaded before calling it quits. It really is too hot for this kind of work in my condition. Back I went to set the stone slab steps. It took about 3 hours in the heat. What’s the next step? I haven’t quite figured that out yet. I’m debating whether to use some field stone to build up the right side of the steps. I’ll go rock hunting tomorrow to see it i can find something I like that may work both aesthetically and functionally. The only problem with large boulders is they’re so much harder to move. They have a tendency to roll off the ramps when loading and unloading. On the plus side – they’re free (on my land) and I don’t have to drive 100 miles (round trip) to get them.